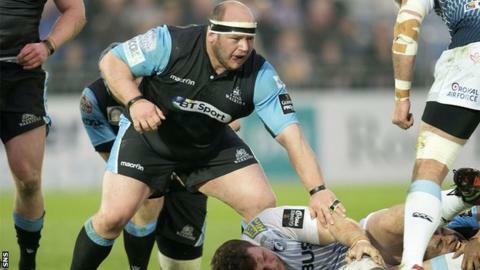 Glasgow Warriors prop Mike Cusack is putting thoughts of Test rugby to the back of his mind as the Pro12 semi-finals loom large. The massive Yorkshireman signed in 2011 as one of the Scottish Rugby Union's project players, becoming eligible after three years of residency. "The main thing is, if you're playing well for Glasgow, you're knocking on the door," Cusack told BBC Scotland. "It is an ambition and hopefully that will come about." However, an ill-fated run of injuries and illness, including a near-two-year spell on the sidelines, have limited the 130kg tighthead to fewer than 50 appearances in his four seasons at the club. After playing off the bench in the Warriors' crucial 32-10 triumph over Ulster on Saturday, Cusack hopes to be involved against the same opposition in Friday's Scotstoun semi-final. "It's been rather frustrating the last couple of years, but it's definitely nice to be back the last few weeks," added Cusack. "It's been a bit of a struggle occasionally, getting a few niggles on the way, but certainly good to be back playing in a semi-final. "The conditioners have looked after me a lot; I've done a lot of work with the physios just to get back ready to play rugby again. It's been a long time for two years with not playing any rugby at all." Committing to Scotland, Cusack was brought north on the recommendation of the national team's scrum coach, Massimo Cuttitta, who worked with the player at Doncaster Knights in the English Championship, converting him from the left to right side of the set-piece. "Massimo was coaching me at Doncaster as well and brought me back here," said Cusack. "My first priority is just getting back fit, really, and just playing. If I'm playing well enough, that's great. "Massimo has had a massive amount of help for me. He's certainly improved Glasgow from when I first came up here. "If you look at the squad, there are four tightheads that play regularly, four hookers as well. There's a massive amount of competition for places, which only breeds performance."